Wedding Date Magnets – What are the first three things that you look in wedding invitation magnets? Perhaps – adorability, affordability and largeness – right?! These are the three characteristics that easily finds value in this magnet. Couples who are deciding to get hitched can suitably get it done as a thematic wedding magnet, wedding calendar, etc. It also makes a suitable choice for sending out invites for pre-wedding bashes or post-wedding events. Team Schedule Magnets – Personalized 3×4.5 magnets make a great choice for imprinting team schedule information because it gives visibility and lasting impact to it. This magnet largely remains affordable for teams, sports marketers, schools, or fundraisers trying to popularize a sports event or raise awareness or build their business. It can be sent out as a mailer or handed out during tradeshows or other promotional events. Calendar Magnets – Customized 4.5x 3 magnets are indeed going to be a value addition to your business. This magnet offers large space and long time visibility to business messages and people kinda start taking your business seriously at the end of the year. People don’t let decorated or impressive magnets go easily, which means additional visibility to your business messages at single investment. Event Announcement Magnets – Your son is graduating, your business is turning older or your classmates are coming together – indeed they sound like exciting message and you wish to share it with all your loved ones and friends around. You can easily do it with 3×4.5 magnets because it offers you enough space for expressing your happiness, inviting the attention of a viewer and also extending invites for celebrations at your place or destined venue. Car Magnets – Custom 3×4.5 car magnets – 30 MIL outdoor safe magnets may not sound exciting for some businesses, but they are indeed a worthy choice for value building. They may not show up from long distances, but they work great at shorter distances. You can always get them suitably done with bright graphics or catchy lines. 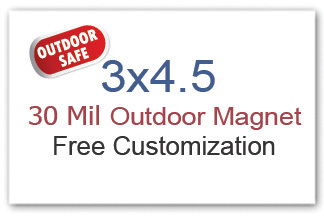 You can buy 3×4.5 custom magnets from any reliable store in different thickness sizes – 20, 25, and 30 MIL (indoor and UV safe). You can always negotiate or avail discounts on bulk ordering these magnets. Free shipping, free art set up, free online design proof – are some perks that await you at the other end of spectrum.